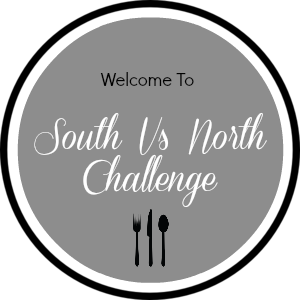 At the start of every month am very eager to know about the SNC Challenge an event owned by Divya Pramil .Through SNC every month am learning new recipes from northern Cusines thanks for divya to introduce this wonderful event. 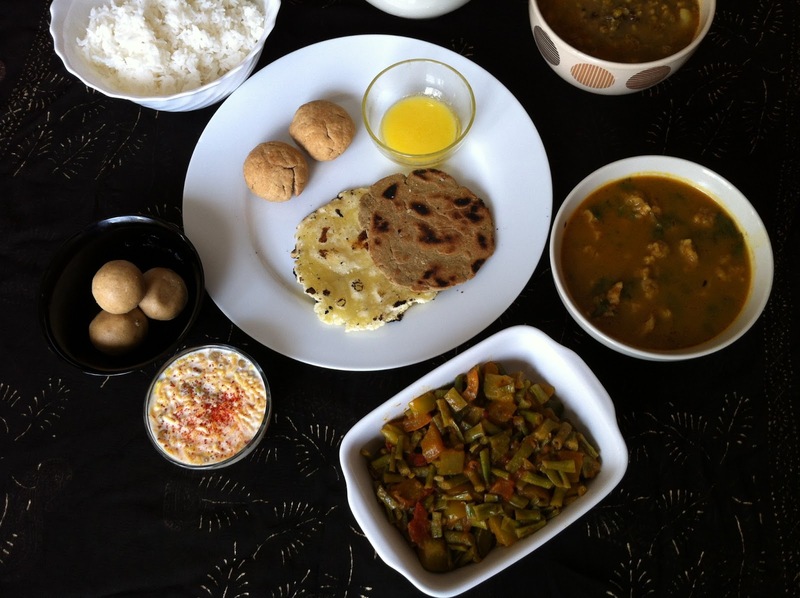 This month challenge by the North team is hosted by Manjula Bharath of Desi Fiesta and the challenge is to make 'Rajasthani Thali' and Sowmya of Nivedhanams challenged the North team with Flavourful Vendhaya Keerai Paruppu Urundai Mor Kuzhambu. Rajasthan is known for tough people and tough food. Rajasthani cooking was influenced by both the war-like lifestyles of its inhabitants and the availability of ingredients in this arid region. Food that could last for several days and could be eaten without heating was preferred. Their food cooked in pure ghee is famous for it's mouth- watering aroma. Rajasthan's tastiest curries are based on the use of pulses or gram flour. Dry fruits, spices and yogurt are used in many delicacies. Rajasthan can also boast of a vast array of savouries and sun-dried snacks. Goond is an "edible gum" that is extracted from the bark of a tree. It is available in crystal form as pearly yellowish translucent pieces of varying sizes.These delicious goond ladoos are a traditional winter delicacy that are had with a glass of warm milk for breakfast.It can be had as dessert after a nice meal. Heat the ghee in a pan, add the whole wheat flour and roast it over a slow flame while stirring continuously till the flour turns golden brown. Allow it to cool. Deep fry the goond/edible gums in hot ghee, one tablespoon at a time till the pieces puff up. Drain on absorbent paper and keep aside. Add the powdered sugar, fried goond and cardamom powder to the roasted wheat flour and mix well. Divide the mixture into 15 portion if you want to make small ladoo's but traditionally they are made in large size and shape each portion into round ladoos using your hands. If you find it difficult to shape the ladoos, add a little melted ghee. Mix all the ingredients n make a stiff dough . Then take a small ball of dough , divide in to equal portions and roll it . Preheat the oven at 375 degrees and place the baati's on a baking sheet for about 15 minutes or till they turn brown on the surface. To give the baati's even color all over after baking you can fry them in ghee till golden brown. The baati's are dipped in pure ghee so that they absorb most of the ghee .However with the daily health regimes , if you are not comfortable dipping the bati in ghee, you may drizzle little bit over the hot baked and fried baati and serve with Dal on side. Pressure cook the Moong Dal. Heat oil in a pan , add cumin, red chilli pd , asafoetida , turmeric followed by the ginger garlic green chillies paste. Saute for 10 seconds and add the cooked Dal and about 1/2 cup water . Add Garam Masala . Let it cook in low flame for about 10 minutes . Millet is so nutritious as it is gluten free. This tasty bread is Rajasthani in origin and goes well with almost any vegetarian or non-vegetarian dish. Put the bajra atta/ millet flour and salt in a large, deep mixing bowl. Make a well in the center. Pour a very small amount of water into this well and start to blend the bajra atta/ millet flour with it. Keep mixing till the flour and water start to come together. DO NOT add too much water as your dough will become sticky if you do! Add very little at a time as required to make the dough come together. We are aiming to make a medium firm dough so add water only as required. Once the flour and water is mixed well, start to knead and continue till you have a smooth, medium-firm dough. When the dough is done, cover with cling film and keep aside for 15 minutes. Now heat a griddle on a medium flame. While the griddle is heating, divide the dough into equal-sized portions - you should get about 7-8 for this recipe - and roll them between your palms, into smooth balls. Lightly flour a rolling surface or board with some bajra atta/ millet flour. Take one ball and press it flat. Now use a rolling pin to roll this ball out into a circular shape about 6" in diameter and approximately 6-8 mm in thickness. When done, pick this circle up from the rolling board and put it on to the hot griddle. Soon you will see tiny bubbles rise on the surface of the Roti. This is the time to do the first flip - turn the Roti over with a spatula. As soon as the first flip is done, drizzle a bit of ghee on the upper surface and spread well all over the Roti. Flip again in 30 seconds and drizzle oil on this surface too. The Bajra Roti is done when both sides are slightly crispy and golden brown. Repeat the process with each ball of dough till all are used up. Combine all the ingredients to form smooth dough. Cover and allow to rest for 5-10 minutes. Flatten the dough by patting it using fingers and palm. Then sprinkle some dry flour and patt on the slight flattened dough and patt again to make round about 6 inches big. plastic using a heavy flat pan or plate. Peel out and roast on hot tava (pan) about a minute each side, should puff up nicely. Heat the oil in a non-stick pan, add the cumin seeds, let them splutter. Add the gavarfali/ cluster beans, chawli/ long beans, capsicum, cucumber, beans and saute for few minutes add Tomato and salt, cook the veggies covered till they are half done . Now add turmeric, red chilli , dhania and cumin pd and mix well till they combine and coat on the vegetables well. We normally don't add any water as the vegetable will leave out some moisture . Cook the the veggies till they are half done... Don't over cook as it may loose its taste. Note : we normally cook this veggie till they are half don which means not over cooked neither under cooked. Serve hot with any Indian breads. In the same sauce pan, add the cumin seeds and after they splutter add all the spice pd and add 1/2 cup water and then the wadies. Add salt and cook them till the wadi's are well cooked and are soft (to cook them soon cover and cook them) . Do add extra water if needed. Add salt and cook them till the wadi's are well cooked and are soft (to cook them soon cover and cook them). 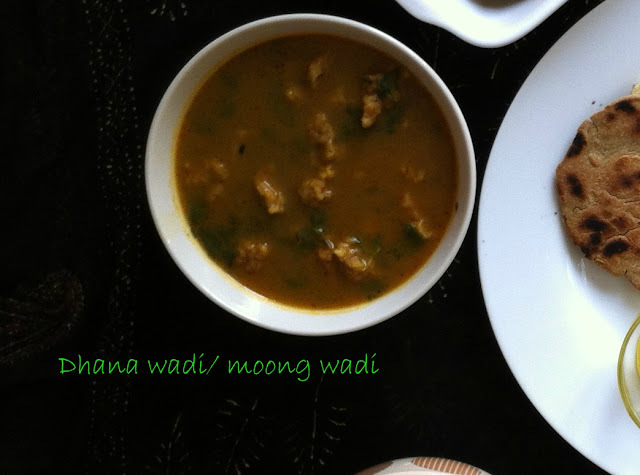 After the wadi's are cooker and the curry is a lil thick turn off the stove and add the coriander leaves. Combine all the ingredients for the gattas and knead into a firm dough using 1 to 2 tbsp of water. Divide the mixture into 8 equal portions and shape each portion into a long cylindrical roll. Boil enough water in a deep pan, add the gattas and cook for 7 to 8 minutes. Drain and cut the gattas into pieces . Keep them aside. Combine the beaten curds, gram flour, ½ cup of water and curry leaves and whisk well so that no lumps remain. When the seeds crackle, add the turmeric powder, chilli powder and sauté for a few seconds. Add the curd mixture, 1 cup of water and salt and bring to a boil while stirring continuously, so that the kadhi does not split/curdle. Keep aside. Add the prepared gattas to the kadhi and bring to a boil. Garnish with coriander and serve hot with rice or parathas. In a blender add all the ingredients excluding boondi blend till smooth and frothy. Then add boondi to the chaas . serve Boondi chaas/ matta chilled. Wow Saranya, thats quite a work, and the long Post .. Hats off !! 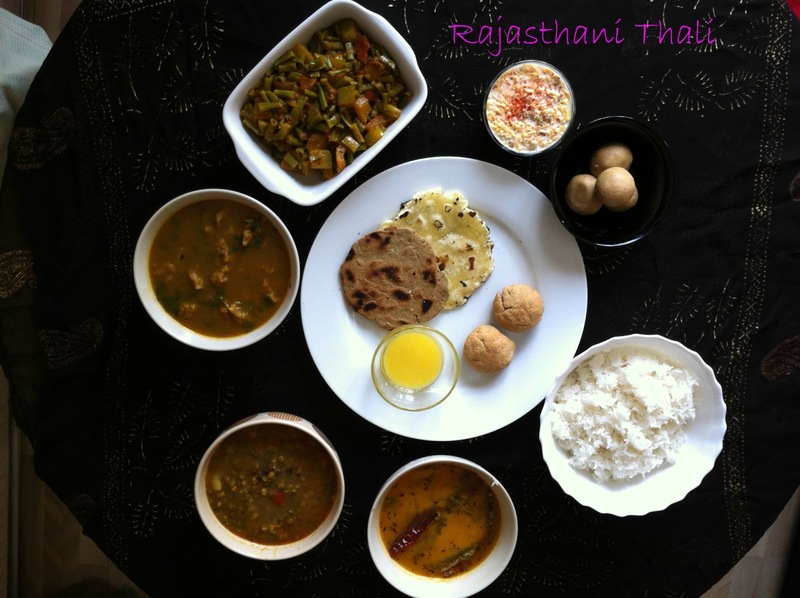 I am glad you enjoyed the Rjasthani bit, I am not Rajasthani myself but having lived in Delhi I love Rajasthani food..
Wow so much effort and looks super delicious and super perfect!! Excellent job dear. Superb treat, a great Rajasthani thali. Delicious recipes with wonderful platter. Wow Saranya!!!!!!!! Just awesome!!!! What a spread there, you have completed the challenge so well :) Hats off dear!! wow !!! that is one really inviting spread..
wonderful post n awesome dishes....inviting platter..n Yummy looking dishes. 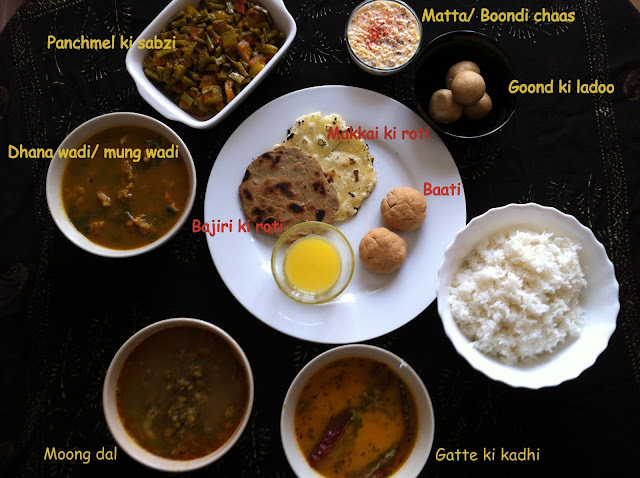 Wow.. That's a perfect looking thali dear.. Hat's off to your efforts !